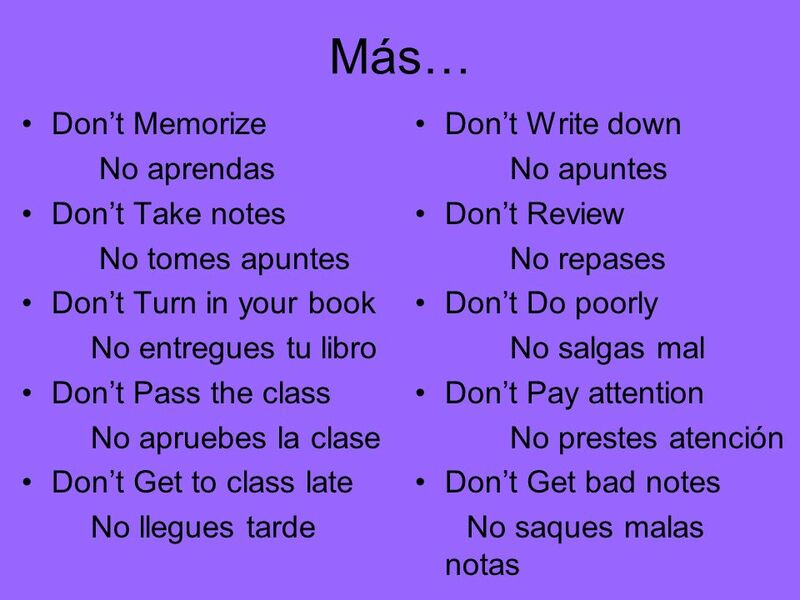 *Come más verduras *Toma buenos apuntes *Levanta pesas *Salta a la cuerda *Bebe mucha agua *Practica los deportes *Rema *Llega a tiempo *Escucha al profesor. 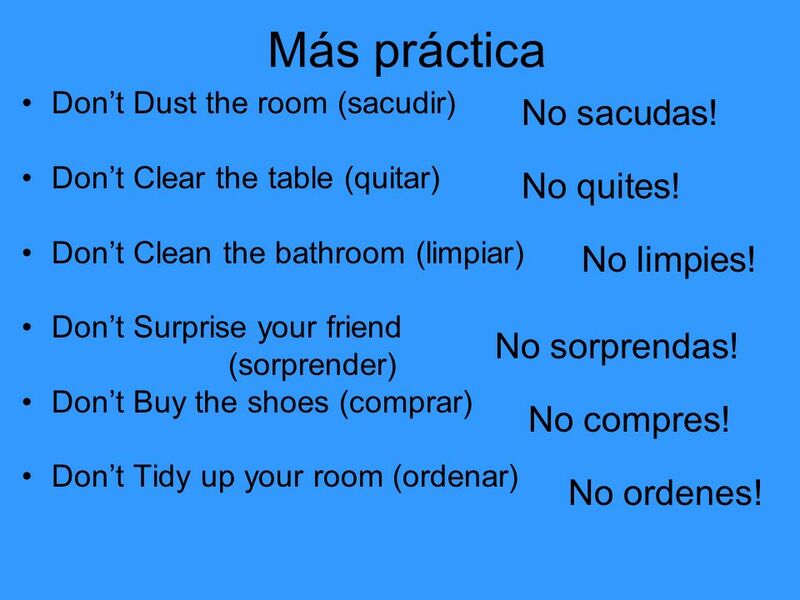 9 Más práctica Dont Dust the room (sacudir) Dont Clear the table (quitar) Dont Clean the bathroom (limpiar) Dont Surprise your friend (sorprender) Dont Buy the shoes (comprar) Dont Tidy up your room (ordenar) No quites! No sacudas! No limpies! No sorprendas! No compres! No ordenes! 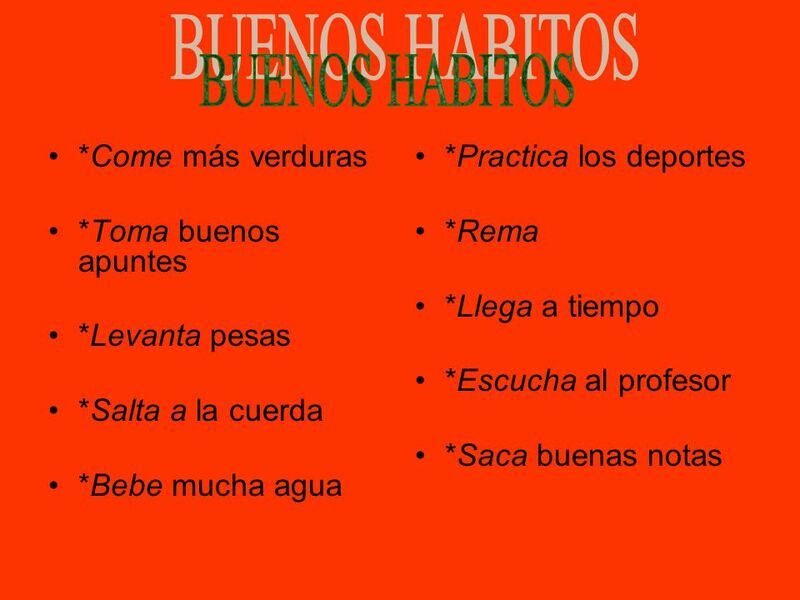 Descargar ppt "*Come más verduras *Toma buenos apuntes *Levanta pesas *Salta a la cuerda *Bebe mucha agua *Practica los deportes *Rema *Llega a tiempo *Escucha al profesor." 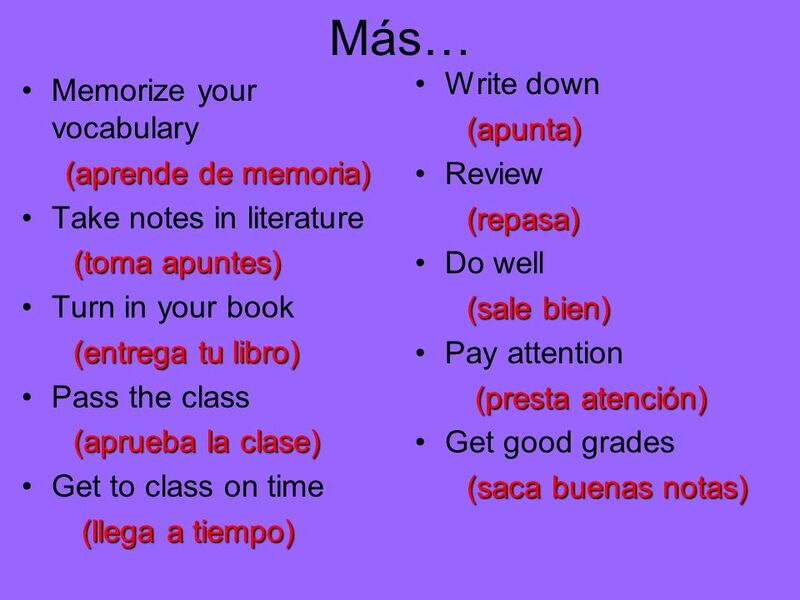 Extra Practice with AR Verb Conjugation. 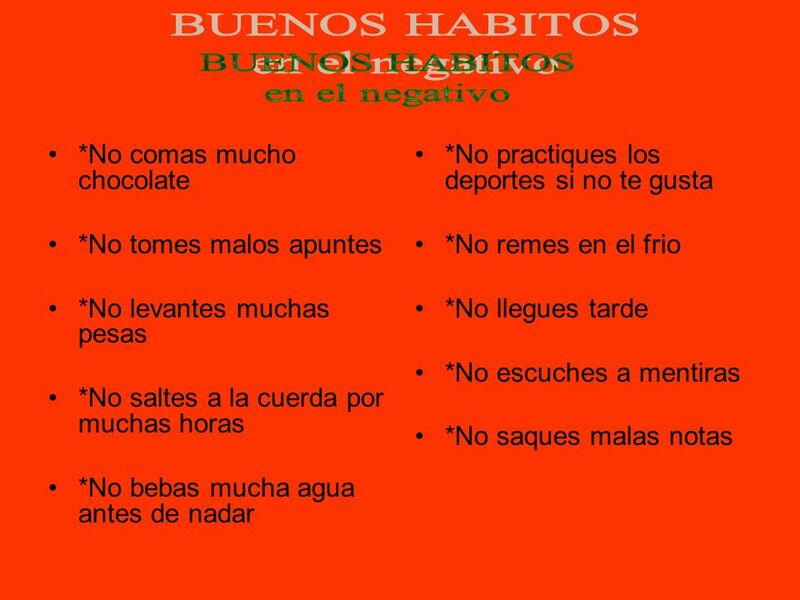 Frases con los Nueve Verbos Nuevos. AR Singular Verb Conjugation Practice. I drink Coke. Command Forms. Cuándo usarlos? 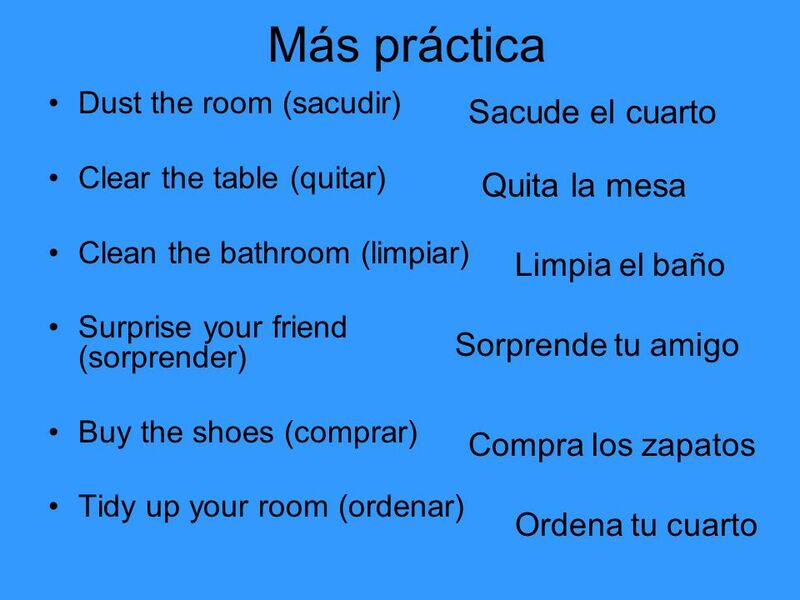 Hay dos tipos: Affirmative: tell someone to do something Clean the dishes! Negative: tell someone not to do something Dont. Sra. 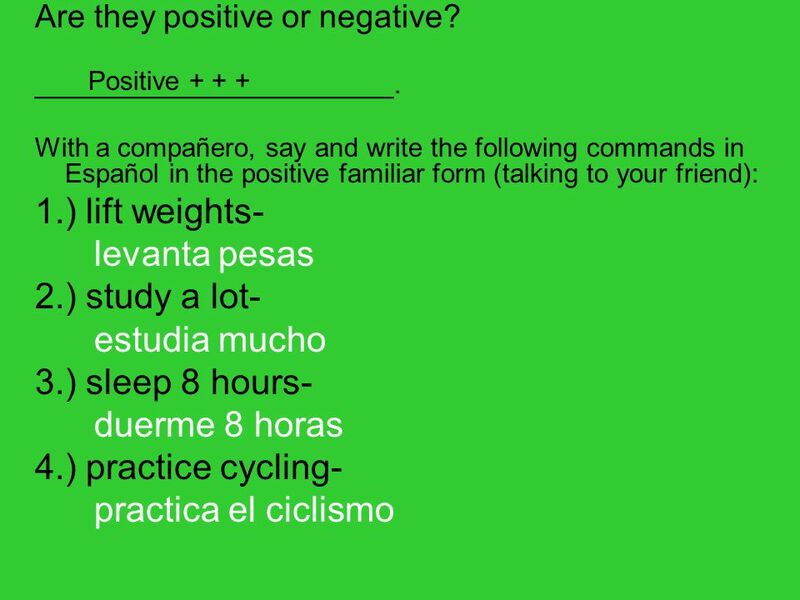 Lear Español1 Unidad 5 Etapa 1 CONTENT OBJECTIVE: S.W.B.A.T. 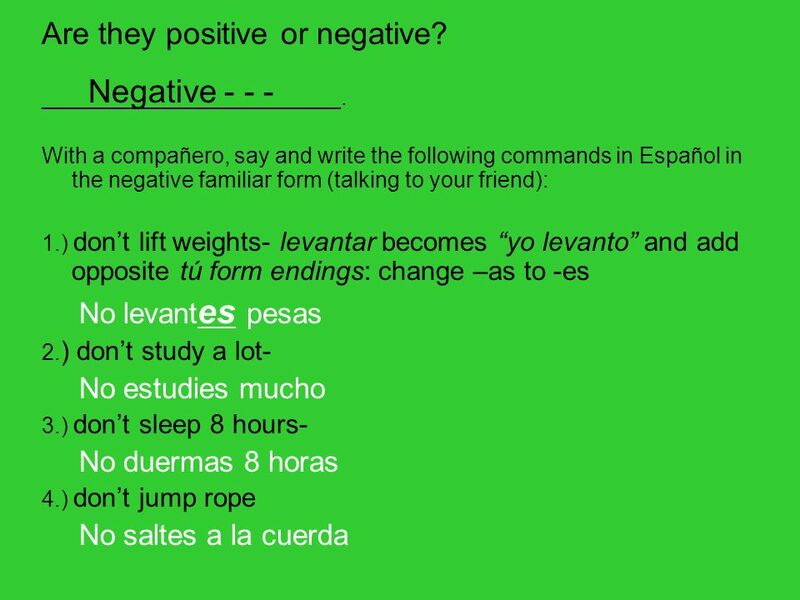 tell someone what not to do with Negative tú Commands. LANGUAGE OBJECTIVE: Students will. 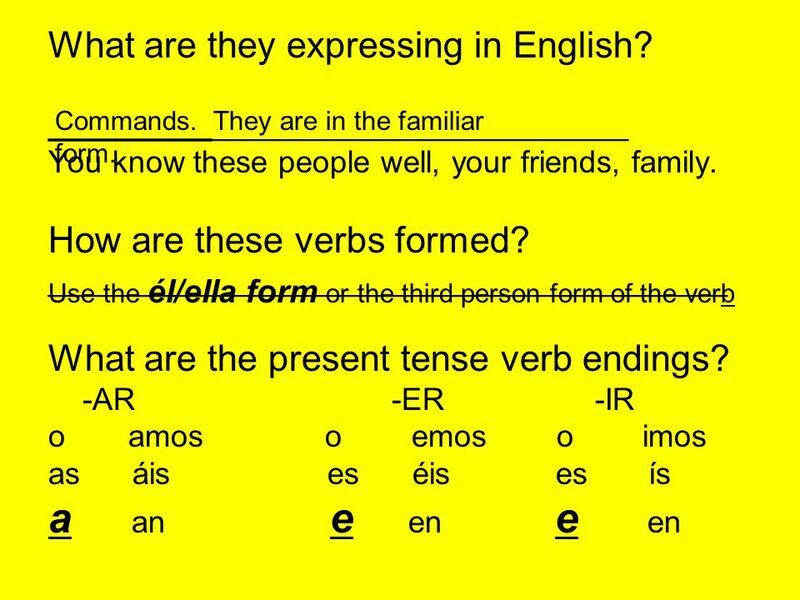 Los Mandatos To give a command to someone you address as tú…we use the informal command form. ¿Qué haces para estar en plena forma? 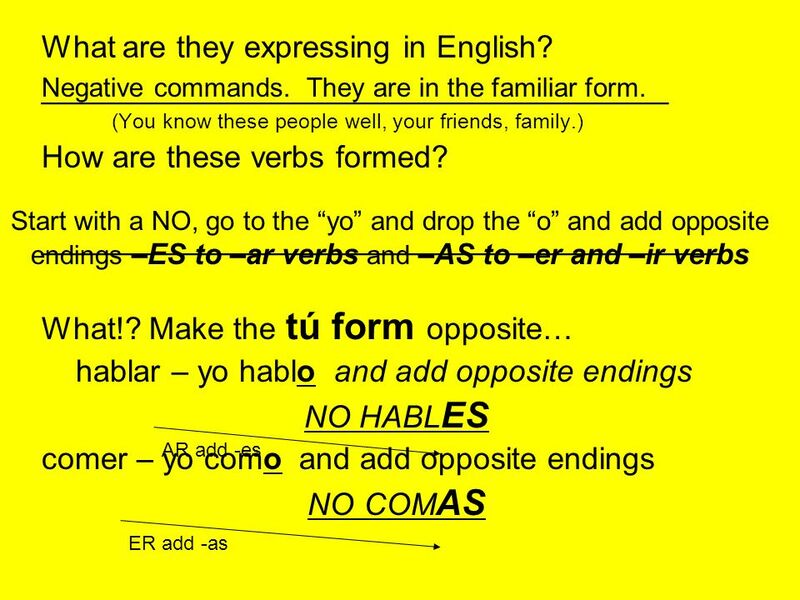 Informal Commands If you are giving a command to someone who is familiar to you (1 person, informal), use the informal tú commands. 1.Define the word certainty. 2.What are examples of things that WILL happen? 3.What are examples of things that MIGHT happen? Tú Commands Español IB Realidades 6B Direction lines… Habla con otra persona. Lee la frase. Escribe la palabra apropriada.